Wayne Schumaker has been passionate about food his entire life, starting from his childhood where he grew up on a fruit farm. Schumaker now has more than two decades of professional culinary experience and has been with Cameron Mitchell Restaurants (CMR) for 10 years serving in many positions and concepts. Upon graduating with a culinary arts degree from the Western Culinary Institute, Schumaker moved to Chicago and worked for the Hilton Hotels company for six years. He started as a line cook and was promoted to banquet chef, sous chef and executive sous chef before being offered a position at Smith & Wollensky in Las Vegas. Schumaker worked for the chophouse chain for four years before being offered an executive chef position at their Columbus location, where he worked for more than a year. In 2004, Schumaker joined the CMR family as a sous chef at Martini Modern Italian. In the last decade, Schumaker has worked in the CMR kitchens of Martini Modern Italian, Mitchell’s Steakhouse, Mitchell’s Ocean Club and Hudson 29 Kitchen + Drink. Schumaker was also a regional chef for CMR where he traveled to various CMR locations to assist the restaurants’ executive chefs and kitchen staff. 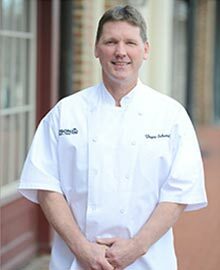 Schumaker currently serves as the executive chef for the Hudson 29 New Albany location. Although he’s supported CMR with more than 10 restaurant openings, he feels it never gets old and is always exciting. Schumaker is driven by the success of others and has learned that in order to be successful, the right team has to be hired and they must have the passion and attitude for cooking and providing genuine hospitality.